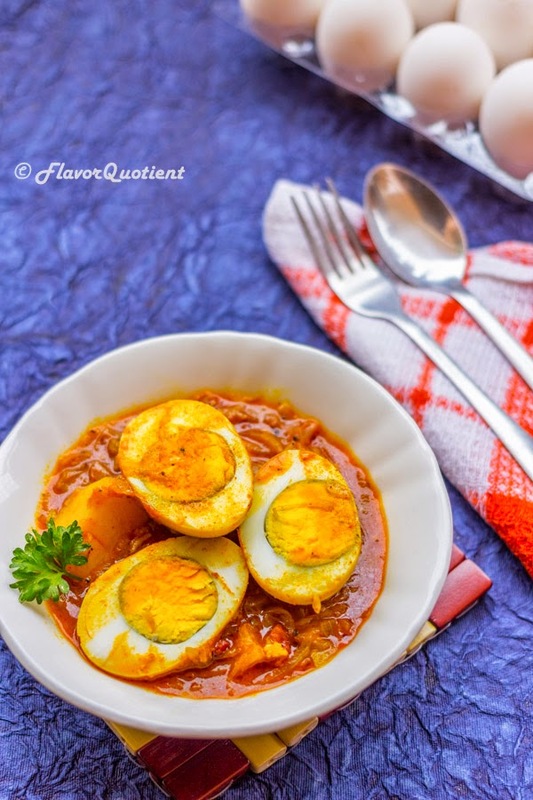 This egg curry has all the elements which can uplift your regular meal to an extremely delightful level and you will cherish every bite of it! 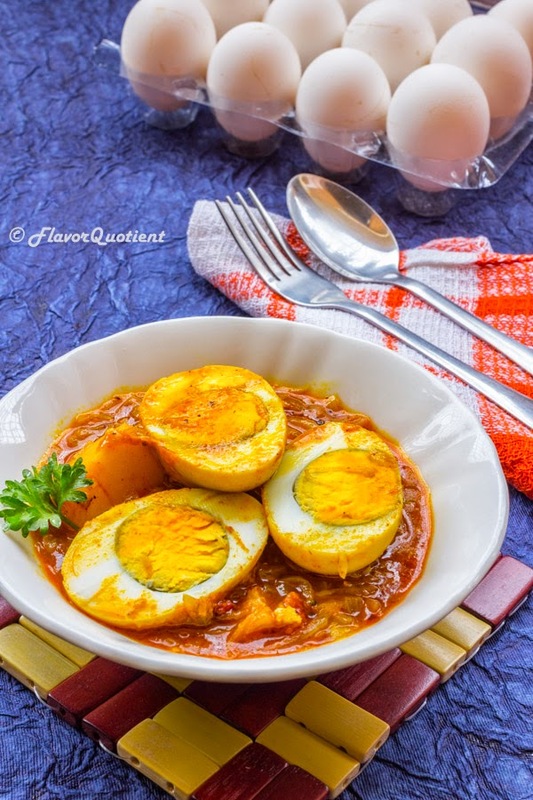 This recipe of spicy egg curry reminds me of my very early days of employment. With a brand-new job and new hopes, I descended on the city of dreams in India – Mumbai! It was the very first time that I was about to start living far away from my home and my parents. With lots of apprehensions, this journey started and then I had to never look back! I am grateful to my parents for letting me enjoy this adventure called life! I started this new life with two of my friends sharing a small apartment in the suburbs. As you can imagine that the first job doesn’t give you wings to fly and that too in a city like Mumbai; we couldn’t afford anything better than a 450 sq ft.; but trust me that time was unforgettable! We all were trying our best to fit into this new phase of life and had our share of joy and sorrow; we laughed, we cried, we fought, we enjoyed, we partied, we cheered and in all these things we discovered ourselves and eventually evolved to what we are today. Now coming a long way after so many years and being well-settled in our own life, I often become nostalgic about those days. 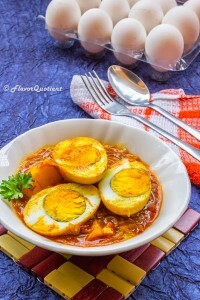 This egg curry adds to that nostalgia and I can’t help but share it with you all! Out of few dishes which we managed to cook during that time, this egg curry of mine became quite popular. This is the regular egg curry which my mom used to make at least once a week. 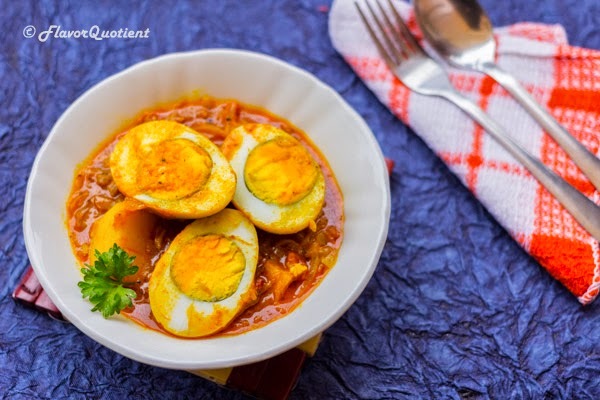 You can call it Bengali egg curry too due to the use of potato which is a trademark of any Bengali curries. Overall it’s a standard curry which any novice cook can make and expect some appreciation on it! Over the years I have made few tweaks into this egg curry recipe here and there but the base is still the same. It’s the good old dim’er jhol i.e. egg and potato gravy which we love to savor with rice and it’s an ultimate comfort food for any Bengali at any given day! Try this at your home and I am sure you will love it as much as we do! Add half teaspoon of turmeric powder and ⅓ tsp of salt to the boiled egg and mix well so that all the eggs are coated well. Heat 1 teaspoon of oil in a non-stick skillet. Tip in the boiled egg and sauté till the eggs are well-browned outside. Take out from oil and set aside. Cut the potatoes in thick French-fries shape. Fry the potato till golden brown. Keep aside. Thinly slice the onions and crush the garlic gloves. Add the crushed garlic cloves and sliced onions. Sauté till the onions are brown. Add ginger paste now and keep stirring for 5 minutes. In a small bowl make a smooth paste with the powdered spices. Mix all the spices adding little water and stir to break any lumps. When the onions are deep brown, add the spice paste and stir on high flame till the oil starts separating from the spice. Add a splash of water and tip in the fried potatoes and eggs stirring continuously. Add water and salt now and bring to boil. Warm water is preferable which will enhance the taste. Once the curry comes to boil, lower the heat and cook covered for 5 minutes or till the potatoes are soft. Uncover and bring to boil on high heat till you get your desired consistency of the gravy and you are done! Sprinkle a fat pinch of garam masala powder and serve hot with white rice. Enjoy!